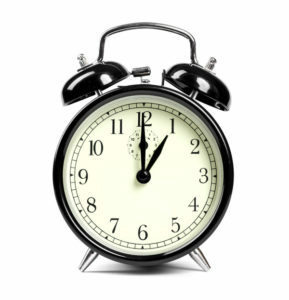 For better time management, we suggest using a tool from Stephen Covey. He was an American educator, author and business consultant, most notably known for his time management strategies. 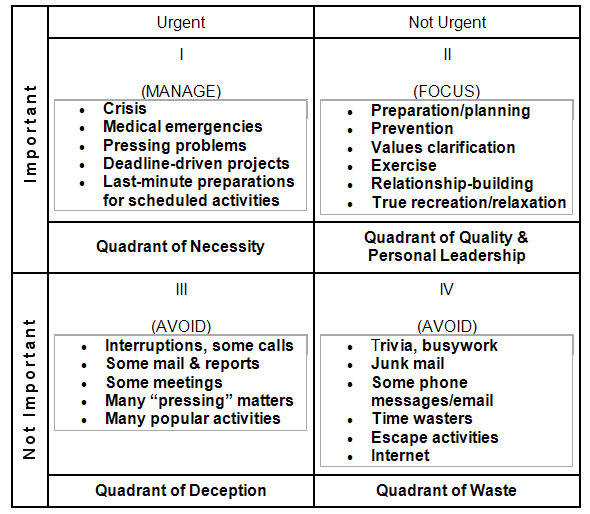 His Time Management Matrix focuses on two key dimensions: 1) urgency and (2) importance of the activities we handle. In the graph below, the more urgent tasks are located on the left-hand side of the grid. The more important tasks are located to the top of the grid. The grid categorizes our activities into four quadrants. We spend time in one of these four ways. Quadrant 1 lists tasks that are urgent and important. 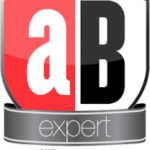 Here is where we handle emergencies, crises and deadline driven projects. We need to spend time here, but many of important activities end up in this urgent quadrant because of procrastination, or because we did not spend enough time planning. Quadrant 2 lists things that are important but NOT urgent. This is the Quality Quadrant. Here we handle quality time with our family, relationship building, self-improvement and quality long range planning. These things are very important, but not pressing this minute. 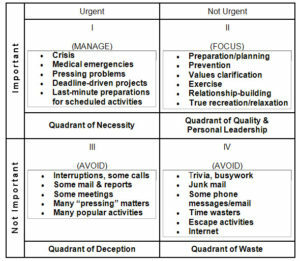 Quadrant 3 includes things that are NOT important but are urgent. These would include interruptions, phone calls, and things that take your attention right now, but are just distractions. This is a Quadrant of Deception because there is the illusion of importance as we meet other people’s priorities, thinking we are in Quadrant 1. Quadrant 4 lists things that are NOT important OR urgent. These are time wasters like watching TV, busy work, some phone calls, some things that you may enjoy doing but aren’t important. We shouldn’t be in this Quadrant of Waste for any extended period. It is o.k. to spend time here for relaxation and decompressing you’re your busy schedule. It can be an escape but if over used it can be a nightmare for time management and stress escalates if this quadrant is just used to waste time. To better comprehend how time management becomes detrimental in your daily life, review your previous week’s schedule. If you were to place each of your last week’s activities in one of these quadrants, where would you say you spent most your time? Now take your list of activities for the coming day and place each activity in one of those four quadrant boxes. See where things land. By focusing our efforts DAILY on separating our tasks and keeping each in its quadrant, our time management will improve. Having the discipline to handle tasks while they are important but not yet urgent will produce higher quality work, and setting priorities will improve. Why is it important to spend more time in Quadrant 2? To have a better handle on your time management, it becomes necessary to move away from handling everything as a matter of urgency and begin to address activities when they are important but not a crisis. This means better planning, and a better focus on what is important. Consider what is the one activity that you know if you did superbly well and consistently would have a significant positive result in your professional or personal life. Such answer might be improving communication with people, better organizing, better self-care, better goal setting. These are all activities that occur in Quadrant 2. But living in Quadrant 2 takes proactive effort. It helps you stay away from the reactive impulses of Quadrants 1 or 3. By focusing on Quadrant 2, you will experience greater productivity. Try setting goals for 3, 6 and 12 months. 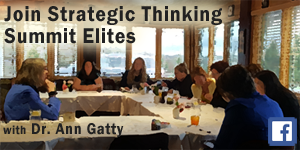 Having short and long range goals requires planning and implementing. Create an action plan to achieve these goals, and assign target dates for completing sub-steps along the way. Spending time in Quadrant 2 is a habit that needs to be practiced so that you stay focused and productive. Try This Exercise to Move into Quadrant 2. List all the Quadrants 1 and 3 activities you handle daily. 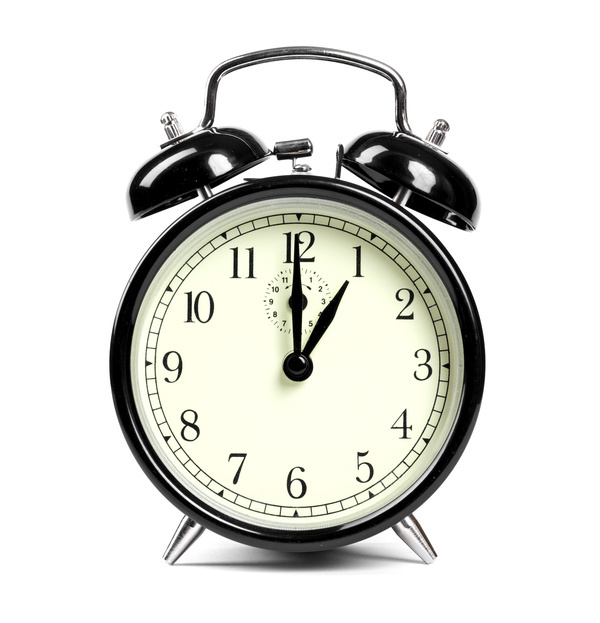 Effective time management strategies do not have to be challenging and stressful. 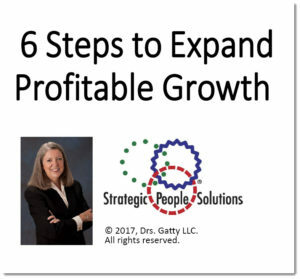 Practicing efficiency and productivity is a game changer in the world of work. Changing from focusing on the urgent to focusing on the important takes time and practice.